This battle took place on one of the great peaks in the Misty Mountains called Zirakzigil. Even getting up to the top of this peak took valiant efforts for the only way up was the Endless Stair. A spiral staircase with thousands upon thousands of steps.This epic battle between Gandalf and the Balrog of Moria lasted 3 grueling days. This is the final sketch for a private black board commission Greg worked on. Greg creates an epic composition of good vs evil! 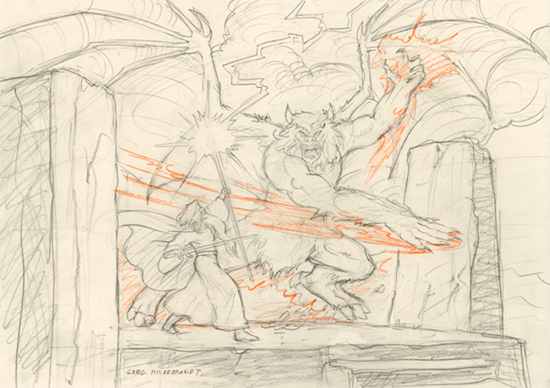 Lighting and fire dance across the page as the Balrog goes to strike Gandalf. Gandalf rises his staff and his sword in hand ready to defend and fight.